I attended the Overland Expo 2014 back in May which is an event is for the do-it-yourself adventure travel enthusiasts, with classes on 4-wheel-drive, adventure motorcycling, inspiration programs, round table discussion, demonstrations and tons of vendors on adventure travel gears, bikes, vehicles and services. I figured it would be a good short trip which is only 421 miles from home to do a practice run before I embark on my year long trip next year. Plus this trip would not be entirely new for me. My late husband and I went this way on our honeymoon three years ago. I’ll do the exact same steps we took that time. I’ll ride from home and make the first stop in Laughlin for the night and then proceed onto Flagstaff for the event. Now onto figuring out what to pack for the trip so I decided to do some research by reading a couple of books such as Going Small – A Guide to Lightweight Motorcycle Touring by Andrew Pain and Lightweight Camping for Motorcycle Travel by Frazier Douglass even though through the years I have learned how to pack minimally since only having a Toyota Corolla to haul the camping gears and the kids. However, I figured too much information wouldn’t hurt so I goggled and read as much information I could find. It doesn’t seems like a lot in the picture but boy I sure realized how much of the work he did on our honeymoon to prepare for this trip and how he took most the weight onto his bike. I don’t know if you already noticed in the picture that I was missing one key item needed for the trip but I sure clueless until I started packing everything up. Yep, I’m missing the sleeping bag! Oh geez, I had to go back into the garage to find it under the pile of stuff that I tossed around looking for the camping gears. Then unpack and re-pack everything once again! Here is the final result…you’ll notice in picture that it is not my bike I used for this trip. I’m currently re-building the motor on my bike and wasn’t done in time for the trip. 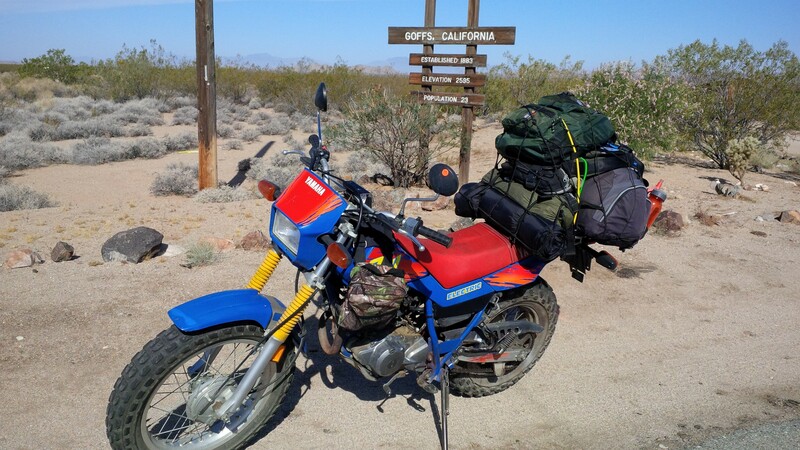 So, one of the TW200forum community members loaned me his bike to use for this trip. I’m forever grateful for the support and camaraderie from this community to help me through the difficult times and to assist me in pursuing my dreams. They’re my biggest fans. 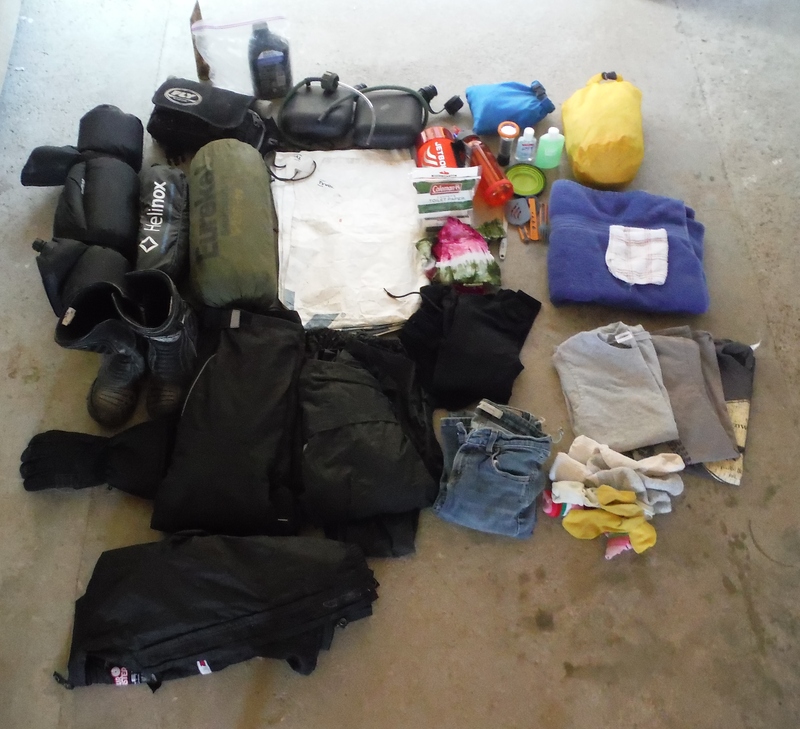 A final note, one of the major things I learned about packing for this trip, having the right panniers or saddle bag will make the difference for the life on the road. My home-made duffel bag is not ideal but I really hate the thoughts of shelling out $400 to $600 dollars for the Giant Loop bag so it worked for now. However, an idea started brewing while on this trip, more to come on this later. Also I learned the importance of having a check list when packing; it’s too easy to forget something. Thanks Donna…it many years of practice and I still need to fine tune it some more.